Sennheiser DW Pro 2 DECT Wireless Office hadset with base station, for desk phone and PC, adjustable mic arm + ultra Noise Cancelation Mic, Binarual. The DW Pro2 headset has been specially designed to meet the needs of all-day users and experienced professionals working in noisy environments, where the productivity benefits of switching from wired to wireless can really be appreciated. Aimed at professionals who need flexible yet fail-safe wireless solutions that are supremely comfortable to wear and intuitive to use, the DW Pro2 sets new standards in listening and wearing comfort. Boasting an enviable range of attractive and innovative Sennheiser technologies, this double-sided headset allows users who demand flexible yet fail-safe wireless solutions to perform at their best. 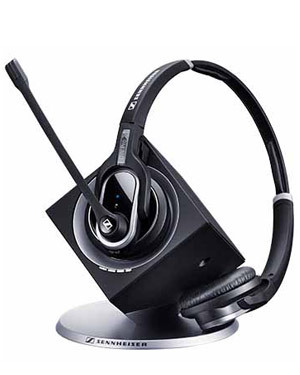 DW Pro2 is a premium double-sided DECT wireless headset for your desk phone and softphone. With the focus on ergonomic perfection in wearing style and the well-being of users, DW Pro2 is specially designed to meet the needs of all-day users and experienced professionals working in noisy environments, where the productivity benefits of switching from wired to wireless can really be appreciated. DW Pro2 looks and sounds great with Sennheiser legacy best-quality speakers and ultra noise-canceling microphone. Additional benefits include full workday talk time, with easy pairing to, and fast recharging on any existing DW Series base station.